Have you ever had Sopapilla? I have a friend who makes them and they are divine! I had to make a healthy version. They taste like a snickerdoodle cookie and a cheesecake had a baby. 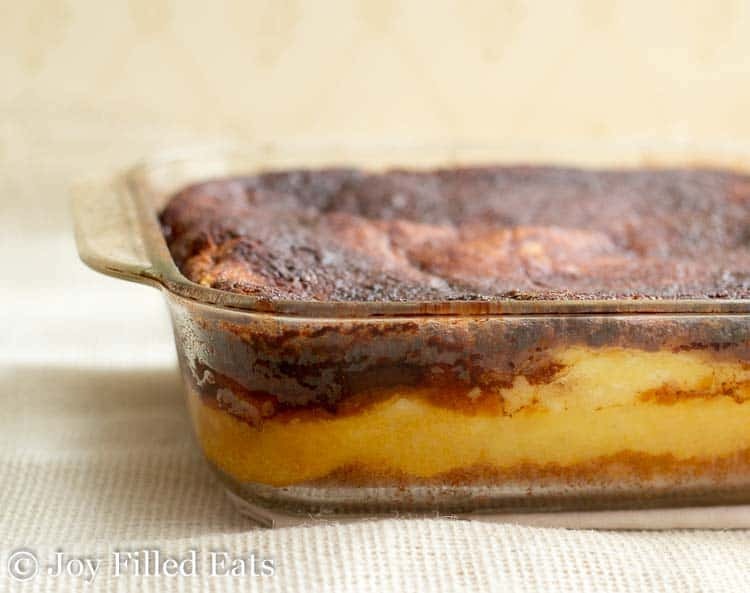 My Sopapilla Cheesecake Bars have layers of a soft slightly sweet dough surrounding cheesecake and topped with cinnamon. These are perfect to share because no plates or forks are needed. 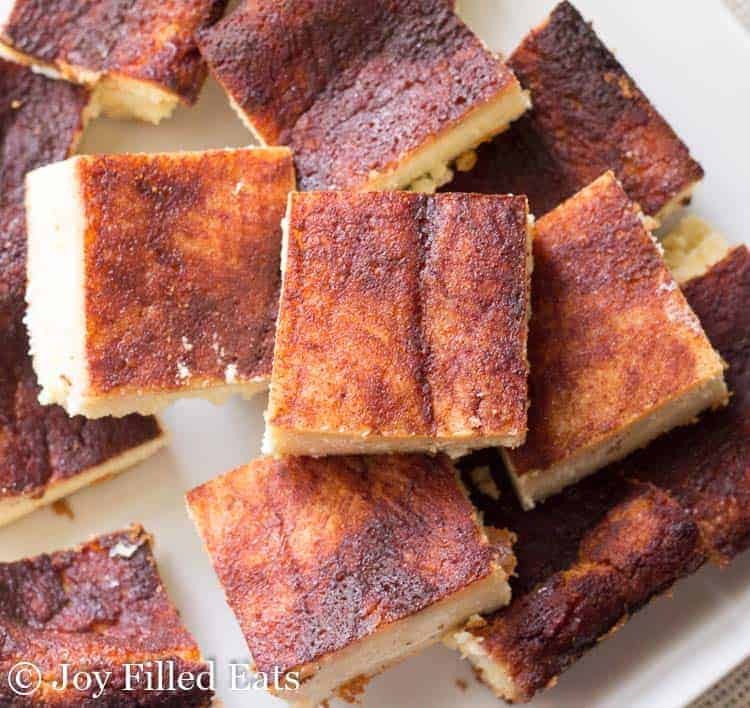 These are my version of the Sopapilla Cheesecake Bars my friend Esther makes that has layers of crescent dough, cheesecake filling, and cinnamon sugar. Ever since she brought those to friend’s house I’ve wanted to make a healthy version. Esther has a great blog too that you should stop over at. She hasn’t blogged much lately but I’ve been encouraging her to start up again. She has a new house to decorate and she does the cutest budget decorating of anyone I know. These take a basic mozzarella dough and sandwich a cheesecake filling inside. You end up with a perfect sweet dough covered cheesecake. If you’ve ever made a fathead pizza before you can make these bars. My trick for this type of dough is to mix it in the food processor. This helps incorporate all of the melted gooey cheese without leaving strands that don’t get mixed it. If you don’t have a food processor you can certainly mix it by hand but it will take some elbow grease. Under that cheesecake batter is the bottom crust. Make all the dough in the food processor. 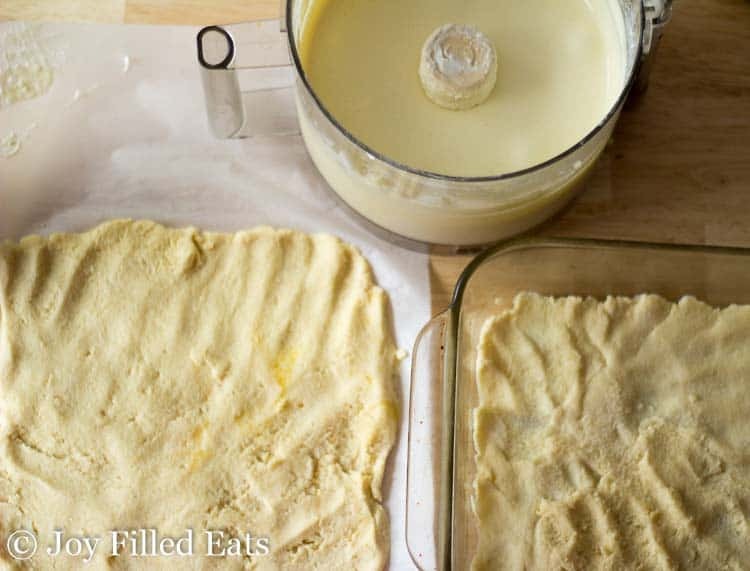 Transfer to parchment paper and you can make the batter without even washing a bowl. With 5 kids and a mini apartment sized dishwasher I need to take steps to avoid the dishing piling up whenever possible. …drizzle with melted butter. Just the combination of melted butter with the sweetener and cinnamon is so good. Try not to lick your fingers too much. When this bakes it will puff up and then fall as it cools. Don’t worry about the falling part. It helps make a compact bar full of luscious cheesecake. 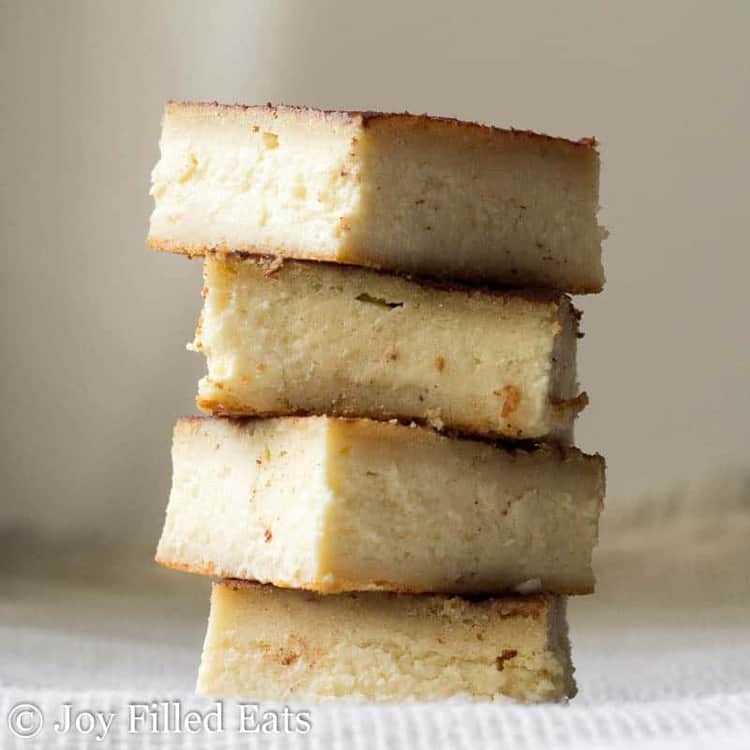 I hope you enjoy these Sopapilla Cheesecake Bars! 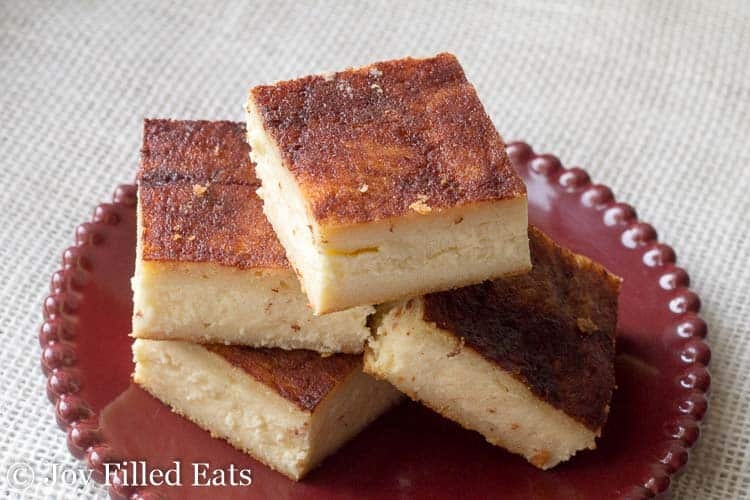 Sopapilla Cheesecake Bars. 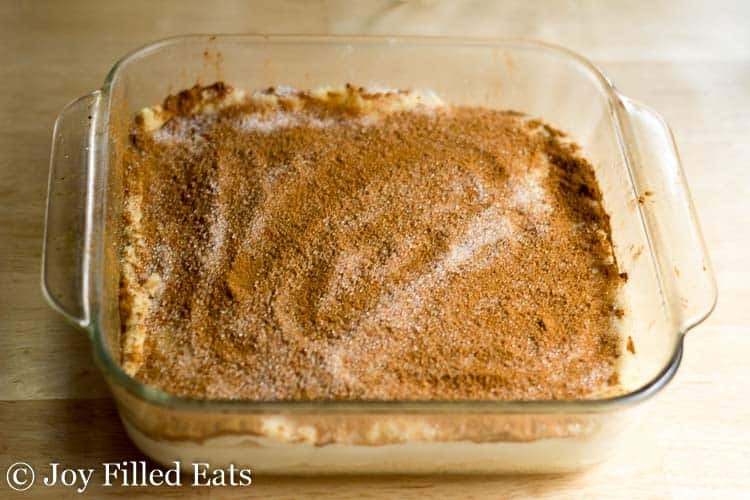 Layers of a soft slightly sweet dough surrounding cheesecake and topped with cinnamon. These are perfect to share because no plates or forks are needed. Put cheese in a microwave-safe bowl. Microwave one minute. Stir. Microwave 30 seconds. Stir. At this point, all the cheese should be melted. Microwave 30 more seconds until uniform and gloopy (it should look like cheese fondue at this point). 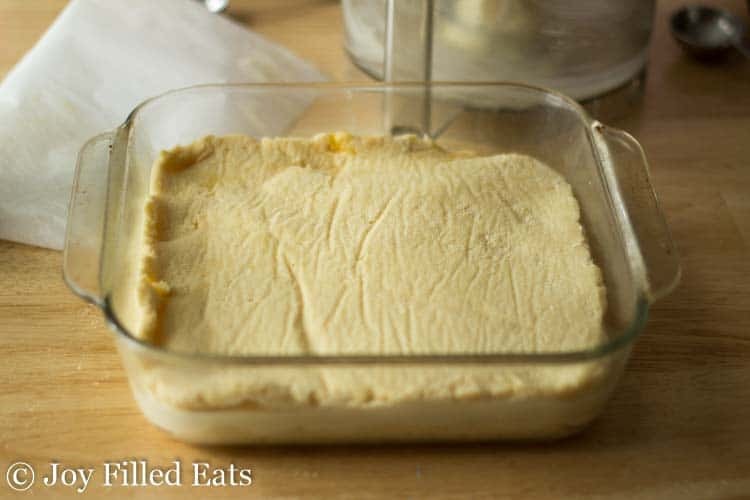 Add the rest of the dough ingredients and the cheese to a food processor. Mix using the dough blade until a uniform color. Once it is a uniform color wet your hands and press half of it into an 8x8 baking dish. Press out the other half into an 8x8 square on a piece of parchment paper. 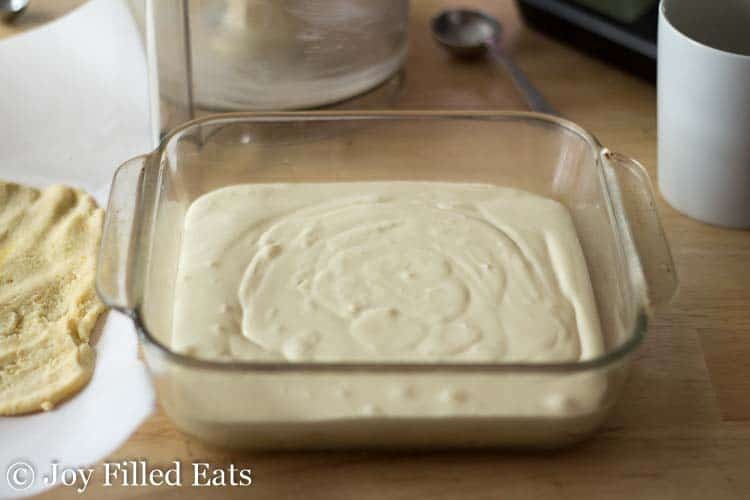 To make the cheesecake filling you can add the cream cheese, vanilla, eggs, and sweetener to the food processor (no need to wash) or to the bowl you were using. Mix until smooth in the food processor or with an electric mixer. Pour the cheesecake batter on top of the bottom layer of dough. 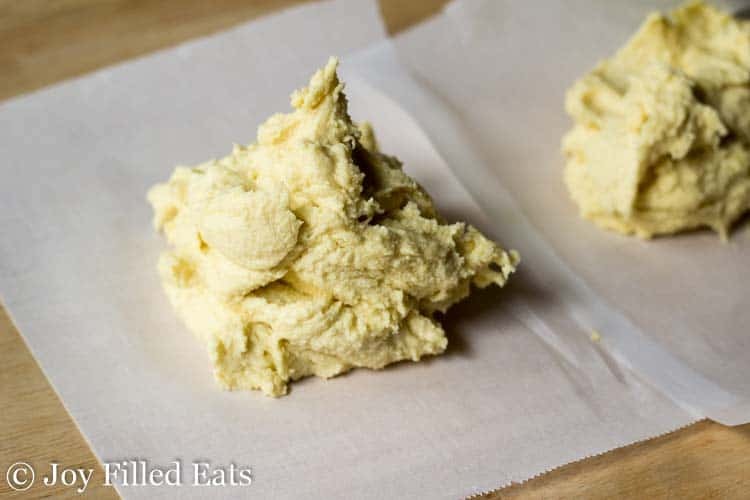 Gently put the other square of dough on top and peel off the parchment paper. 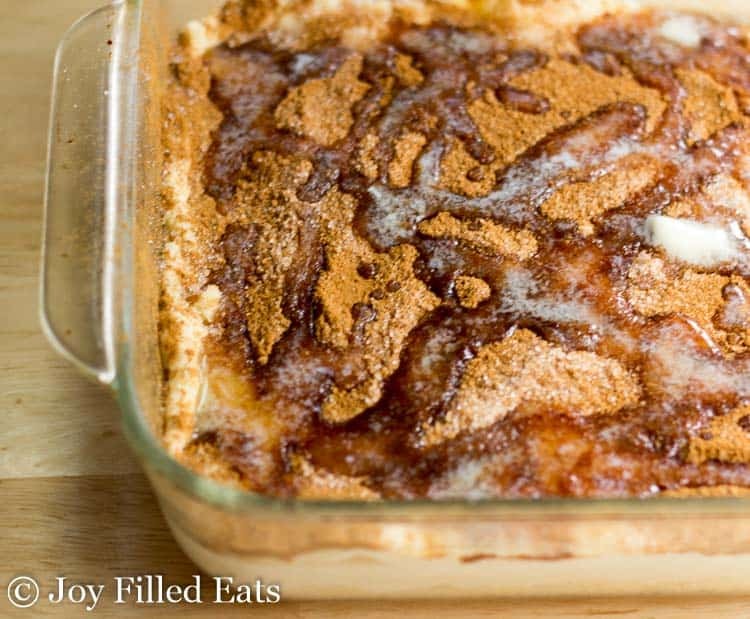 Sprinkle the sweetener and cinnamon on top and drizzle with the melted butter. Bake for 50-60 minutes until puffed up and golden brown. If the butter pools in the center you can brush it over the top with a pastry brush during the last 20 minutes of baking. If you do not have a food processor you can mix in a medium bowl with a wooden spoon but you may need to dump it onto wax paper and knead it by hand to thoroughly incorporate the ingredients. First Published September 21, 2016. Revised and Republished July 10, 2018. Can I use Stevia as the sweetener? Stevia extract or a stevia blend? It’s Pyure organic stevia blend. Yes, pyure should work in this recipe. You only need 1/4 to 1/2 of the amount listed. These are beautiful -- can't wait to try them! What an incredible recipe! This has all of the amazing flavor I would expect! What do you mean by the dough blade on the food processor? I have. Dough hook for my Kitchen aid mixer?? You can use your stand mixer. Enjoy! I can't seem to find how many servings this makes. Also wondering if it can be frozen? Looks wonderful. At the top of the recipe card, it says it makes 16 bars. It can be hard to find. I have not tried freezing this but cheesecake, in general, does freeze well so I think these would too! Yes, I keep most of my baked goods refrigerated but especially anything like a cheesecake. You can use sunflower seed flour, ground golden flax, or all coconut flour. If you decide to use all coconut flour use half the amount. This looks delicious! I don't have coconut flour, could I use the same amount of almond flour? Use a little extra almond flour. It doesn't absorb as much liquid as the coconut flour so you need more. Thanks so much! I used 1 & 1/3 cups of almond flour total and they turned out great and DELICIOUS! Thanks so much! This recipe is yummy! I was not very successful at rolling out the top layer of dough on parchment paper & laying it in top of the cream cheese layer. ANy tips on how to do this? It seems like the dough won’t separate from the parchment paper. Thank you for sharing this! You could grease the parchment so it releases the dough easier. Any thoughts on how to make this egg free? I’m allergic to eggs. Thanks! Hmmm, I'm not sure if there is a way to make the mozzarella dough without eggs. You could do a no bake cheesecake with gelatin and use a pie crust type dough. Instead of 1/3 cup almond flour and 1/3 cup coconut flour can you use 2/3 cup THM Baking Blend? Thanks I love your recipes. I follow you on Instagram. We made your Broccoli Bacon Ranch Casserole. It was delicious! If the food in all the recipes taste even half as amazing as your pictures, it is pure gold! Beautiful food blog. Thanks for all your hard work for the sake of us "foodies" that are working on better health! Hi Leeanne, you should be able to sub in baking blend in this recipe. I hope you enjoy it! 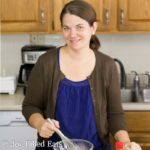 What a unique recipe and I love that you made it Keto friendly. These came together quickly and are so delicious! I LOVE sopapilla but never make them! 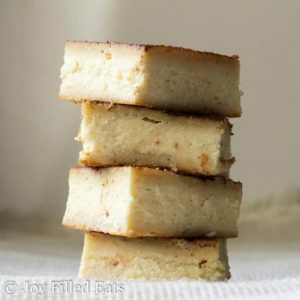 These bars are genius - so easy and so delicious!! Definitely making these soon! This is my kind of dessert. Dense and not over the top sweet. Love the cinnamon top. I can imagine how this smells as it bakes. Looks like it would transport well. Perfect to take to BBQ parties or picnics this summer. These look wonderful! I'm excited to have another keto dessert recipe to add to my files. These are in the oven right now. They look, and smell, like they will be amazing. And the filling tasted pretty good from the spatula!!! A few comments about the process... 1. I used Swerve (erythritol) and was plugging all ingredients in to MyFitnessPal recipe generator. Because the amount of sweetener is significant, it yields 144 grams of Carbohydrate in the recipe (Swerve is 4 grams/tsp. ), which then shows as 13 grams per recipe serving. This, of course, can be misleading as sugar alcohols don't "count," in context. For comparison, the Trim Healthy Mama Gentle Sweet nutrition label shows 3 grams/tsp. and would yield 108 grams total carbohydrate in this recipe. Point being, the Nutrition Facts shown at the end of the recipe MUST be subtracting the sugar alcohol "carbohydrate" from their count. 2. The dough came together nicely, but I felt like I almost ran out of material. What probably happened is I didn't evenly divide the top and bottom layers. Either way, I would suggest rolling both layers out on parchment first (with a wet roller) as I found the spreading of the bottom layer by hand was difficult to get an even layer. It will also allow you to see if you have too much or too little and make more consistent layers. 3. I mixed the cinnamon and Swerve together first in a shaker bottle, for an even distribution. Once I started shaking it on, it seemed like A LOT. But keep going, because how can there really be too much sweet, cinnamon-y flavor! Can't wait to try them.